2018 Polaris Ranger 150 Full Review. The Good, The Bad, and a Problem. The new for 2018 Polaris Ranger 150. Plenty of fun for the kids and plenty of parental control through the new smart phone app. 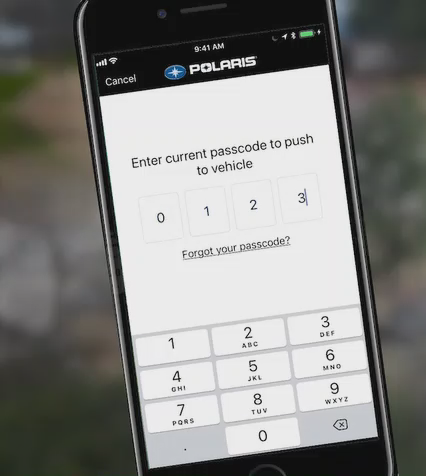 The new app is called "Ride Command Technology" by Polaris. It can be activated and controlled from a smart phone. It includes a safe start mode that requires the input of a passcode. 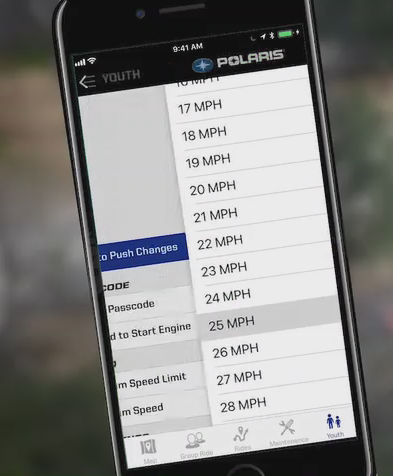 Parents can also set the speed limit through the app. Any speed from a brisk walk to nearly 30 mph is possible. All with one touch on a screen. The most interesting feature is something called "Geo-fencing". It's a GPS based boundary "fence" that can be set to limit the riding area available to the Polaris Ranger 150. No more hanging on to a tether to keep the little ones from making the Great Escape! Select speed directly from the app. 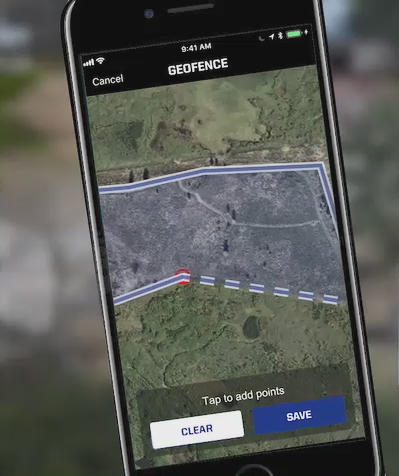 Set riding boundaries with GPS based Geo-Fence. More conventional safety features include protective cage, seatbelt interlocking system, door nets, safety flag, passenger grab bar and two helmets. Getting to Know the Polaris Ranger 150. 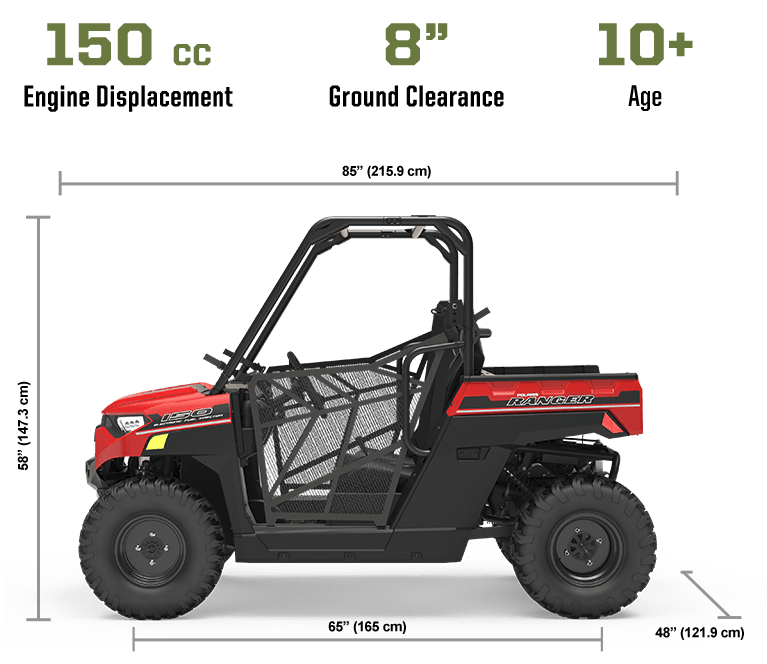 Dimensions for the 2018 Polaris Ranger 150. 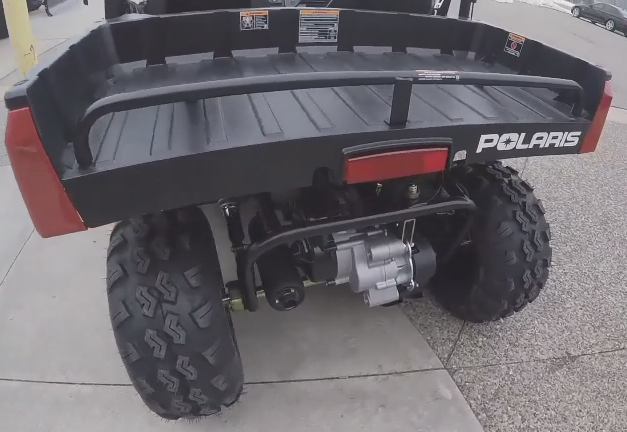 2018 Polaris Ranger 150 Specifications. Driveline - 150cc engine, air and oil cooled, electronoic fuel injected. CVT trans. Rear wheel drive. Body/Chassis/Interior - Adjustable seat and steering wheel. parking brake. seat belts and door nets. passenger grab bar. bright red brake pedal. Suspension/Brakes - Independent coil spring front suspension. swing arm rear suspension with dual shocks. 4-wheel disc brakes. 8 in ground clearance, 5 inch front wheel travel. 6 inch rear wheel travel. The Polaris Ranger 150 is intended for those 10 years old or older. Adjustable seats and steering wheel will fit a variety of sizes. Seat belts, door nets, and a passenger grab bar will keep them inside. Polaris includes 2 helmets. Good idea to use them. Power - Good for what it is. Depends largely on speed limit settings. Handling - Decent wheel travel and ground clearance. Solid rear axle on swing arm with dual shocks is predictable and works fine with the relatively low power. Ride - Not bad at intended speeds. Solid axle rear suspension can jolt a little. Brakes - 4 wheel discs do the job. 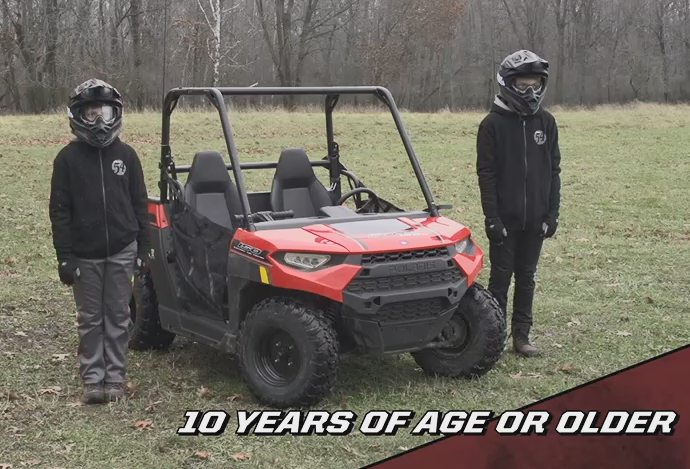 How Does it Stack Up in the Youth ATV/UTV Category? Safest youth ATV/UTV on market now. The parental control app breaks new ground in supervising the kid’s driving. No more walking behind with a tether kill switch! Has a semi-functional rear bed, But it’s really aimed at safe fun with plenty of supervision. RZR 170 and Ace 150. Neither quite like ranger and don’t have new app controls. The Ranger 150 has a sizable rear bed with a bar guard to prevent unwanted passengers. Rear suspension is a swingarm mounted rear axle with dual shocks. As a new model, it hasn’t been out long enough to have a significant number of reported problems. However, most of the running gear is based on the single seat Ace 150. It’s been out for at least a year and we haven’t heard about any unusual problems except one. We’ve heard of a few cases when the Ace 150 goes into “limp mode” (limited engine power). Dealers tell us this is normally caused by depressing the gas and brake pedals at the same time. Might be something you want to mention to the dealer before you buy. The 2018 Ranger 150 provides another choice in the Youth ATV/UTV category. The advanced safety features set it apart from the RZR 170. The Ace 150 has virtually the same drivetrain, but without 2 place seating or any kind of rear bed. On the negative side, reports of some problems with the reliability of a few of those safety features is a little concerning. Nothing will ruin your fun faster than some glitchy software that keeps your ride from running. 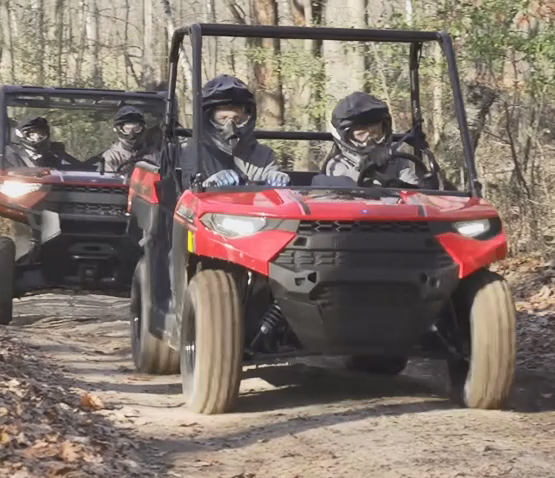 The 2018 Ranger 150 is the most expensive of the Polaris youth models. The closest model to it is the RZR 170 at about $200 less. But it doesn’t have all the safety features of the mini-Ranger. If you don’t need a 2-seater, the ACE 150 comes in at about $1200 less. Also without the Ride Command safety app. Value of the new Ranger 150 seems in line with the other models. We’d say the RZR 170 is a little more performance oriented while the little Ranger leans a bit more to the safety side of things. If you have a couple of 10+ year olds that need a safe way to get into off-roading, the Polaris Ranger 150 is a good choice. With the adjustable seats, steering wheel, and speed controls, it’s ready to grow with them. 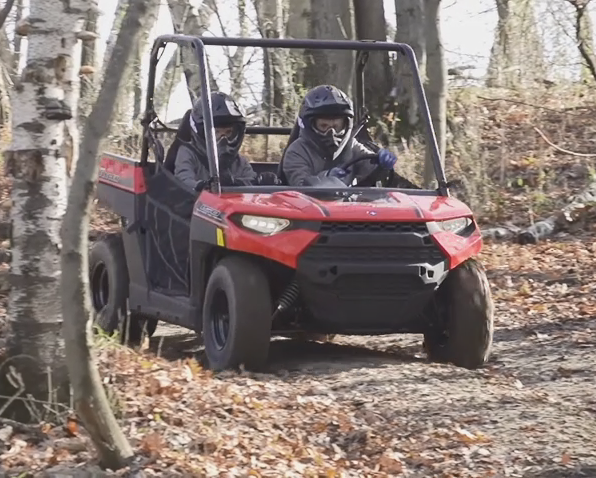 The Ranger 150 is a great way to introduce the kids to off-roading with their own machine.